Every academic administrator knows that it’s important to increase student enrollment, but it’s much harder to know how to increase enrollment. For the past decade, slow but steady decline in student enrollment has left many academic marketing professionals feeling discouraged. Public and private schools have struggled to cope with the changing enrollment landscape, and many haven’t been able to adapt. That’s where we can help. After working with community colleges for decades, we’ve developed effective strategies for increasing student enrollment. 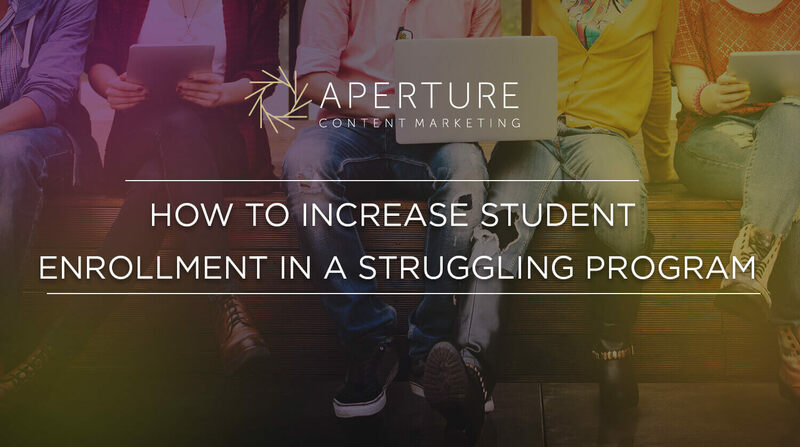 We start by identifying the programs with the most growth potential, and then use data-driven content marketing strategies to attract the right kind of student. Today we’re sharing our four-stage college enrollment plan. If you are reading this article, you may already know which of your programs are struggling. If you don’t, then identifying your biggest challenges is the first step in overcoming them. Find out which programs have a high capital investment, but not enough seats filled. The IPEDS report might be a good place to start if you don’t have ready data on your enrollment numbers. After you have the information you need, research the struggling programs. Reach out to the program directors and ask how many seats need to be filled. Begin a constructive dialogue about how you can increase student enrollment. They probably have a valuable perspective on the program’s struggles and may be able to give you some insight into why the student roster is so lean. Once you’ve done your initial research into the programs, step back and assess the larger picture. Are the programs ‘up to snuff’? As a marketing professional, you know that a great marketing initiative will not help a poor product. Make a clear-eyed comparison between the struggling program and similar programs at other schools. It’s also important to get a sense of local and national trends. What careers can a certificate or degree in this program offer? What are the salary ranges? Do the struggling programs have viable and attractive job opportunities in the local economy? How many job opportunities predicted nationally? Is there growth potential in this field? Sometimes programs are struggling because the economic demand has shifted to other industries. By the end of this research process, you should have collected a wealth of information about each struggling program. A few of these programs should stand out. They will have low enrollment, high capital investment, motivated directors and strong course offerings, and meet emerging economic demands in well-paying, rapid-growth industries. Select one or two of the programs that meet these criteria for your new marketing campaign. With your programs and enrollment goals in mind, you can begin creating a high-quality, multi-channel content marketing campaign designed to increase student enrollment. It’s important to weave a compelling narrative featuring real stories that could connect with prospective students. Interviewing people involved with the program is a great place to begin. First, interview a current student in the program about their aspirations and struggles. Give readers someone they can identify with, who mirrors the type of student you are hoping to attract. Follow that story by interviewing a graduate who just landed a great career after completing the program. Finally, find an employer who just hired someone from the program, and who can speak to the value of an education. Throughout this whole process take good, professional quality photos. These are important for attracting attention on social media sites as well as illustrating your print materials. If you can, have a professional videographer record some of the interviews. Younger consumers especially respond well to video content. At this point you should be pushing out your stories on multiple platforms. As you share the stories and images on social media, make room for other students and prospective students to engage with the content and tell their own stories. The more authentic online engagement you have, the more views your content will receive. For the content to actually increase enrollment, it’s important that every piece contains a clear and straightforward contact information for the program. Even better, focus on honing your inbound marketing strategies so that the interest you generate online leads to real prospects. You need to do more than build traffic, or your campaign won’t help your enrollment numbers. At this point it’s also important to coordinate with your office of admissions, so that other crucial aspects of the process go smoothly, like campus visits, and the application experience. And stay abreast of rapidly changing technologies – students are using their mobile devices to search for colleges and access their applications, especially minority and low-income students. It’s crucial that your web resources are mobile friendly. Education is the best path into the future for so many people, and with the right message your school can be the one providing it. It may not be easy to increase your student enrollment, but with a strong marketing campaign it can be done. By following our blueprint for a strong content marketing campaign, community colleges have seen real results. Maybe everything you’ve tried so far isn’t working, and you don’t think your school can turn things around alone. If so, it might be time to call in the experts. We can provide the support you need to create a strong content marketing campaign, launch a mobile-friendly web page, and understand your market demographics. Contact us today for a demonstration of our services.